Spotify to impose limits on free music streaming service | What Hi-Fi? • New Spotify users will be able to enjoy the free service as it currently exists (with ads) for the first six months after they sign up. • From May 1st, any user who signed up to the free service on or before November 1st 2010 will be able to play each track for free up to five times. 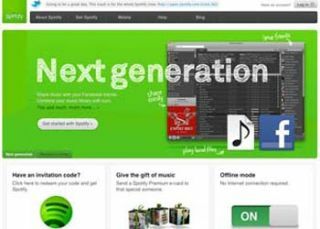 * Users who signed up after November 2010 will see these changes applied six months after the time they set up their Spotify account. • Additionally, total listening time for free users will be limited to ten hours a month after the first six months. Spotify says this is equivalent to around 200 tracks or 20 albums. "The changes we're having to make will mainly affect heavier Spotify Free and Open users," the company says. It claims most 'free' users listen to an average of 50 tracks per month so won't notice any difference. Spotify's Unlimited and Premium services remain unaffected, and during May there'll be a 30-day free trial for Spotify Premium in a bid to tempt people to pay for the service.